So far it's great submitted by Susan - May 07, 2015 |Recommended: YesI moved here in January 15 from another Paradigm Management property and I really like it so far. The location near the Eisenhower metro is very convenient. It's close to King Street attractions and restaurants, but can be a bit of a hike to the end near the river. I feel safe here, which is very important. There are several restaurants close by and the AMC movie theater. Whole Foods is a short walk. Overall, it's a really good area to live in. There is always plenty of parking, however, the ramps are a little tight. I almost always have to do a 3 point turn to get on off the ramp. Minor inconvenience considering I don't drive much. I have never heard my neighbors, except occasionally when walking down the hallways. It's nicer outside than insidesubmitted by Jennice N. - May 06, 2015 |Recommended: YesConvenient to metro and beltway. It's perfect in that sense. Overall Outstanding.submitted by Brandon C. - Sep 04, 2014 |Recommended: YesExceptional. Living at Carlyle Place has made my personal life convenient, efficient, and relaxed - a welcomed counterbalance to my professional demands. 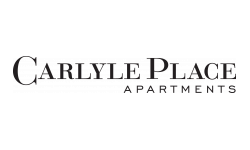 The best apartment community in Alexandria.submitted by Karen C. - May 22, 2014 |Recommended: YesCarlyle Place is a clean, modern, pleasant environment with a very attentive staff. Great location, wonderful staffsubmitted by Anonymous - May 21, 2014 |Recommended: YesI've lived here for almost 8 months and I will tell you, the staff has been great. Always friendly. I have no complaints at all. Plus my utility bill has been unbelievably low even for a 1 bedroom apartment. The highest bill to date was 58.00. During the winter it was as low as the $30s. Professional, great communication and friendly residentssubmitted by Angela A. - Mar 02, 2014 |Recommended: YesThe entire staff from the leasing office to the concierge to the maintenance folks is always friendly, courteous and professional. Corrine at the leasing office is always on top of her game and I cannot tell you how much I appreciate the candor and frequent updates from the property manager. It's convenient being so close to the freeway, metro and Old Town as well as a couple of running trails. I love living here. Great Locationsubmitted by David - Jan 29, 2014 |Recommended: YesIt's a very nice place to call home. Staff is great and the front desk guy is great. Being in the city where it is, it can get busy outside with noise from fire trucks and garbage trucks and such. Overall a great place to be, within walking distance to anything you can think of, and the metro station is right down the street. I love this place. All staff from managers, leasing agents to housekeeping and maintenance are very helpful.submitted by Phyllis J. - Dec 30, 2013 |Recommended: YesI'd tell them that I love this place. It is the best place to live and offers the most in value for the area. I have absolutely loved living here! !submitted by Denise - Dec 22, 2013 |Recommended: YesI have lived here for 5 years and have loved every minute of it! It's a very quiet, friendly community. I've look at at other apartments in the area and you get quality at Carlyle Place -- granite countertops, stainless steel appliances and more! The maintenance staff are amazing! The concierge are friendly. My neighbors have been great! The location is great -- close to the Metro, the Interstate, Old Town, DC. There are lots of great restaurants, shops and more! Loads of history in the area and great trails. I am moving soon and hate to go, but I'm off to bigger, better things! I will truly miss this place!! Nice place to livesubmitted by Meng Z. - Oct 28, 2013 |Recommended: YesIt's a nice place to live. Management is professional and people are friendly. The building is overall well maintained and managed. The neighborhood is pleasant. I love the facilities, the community, and the view!submitted by David F. - Oct 16, 2013 |Recommended: YesIt is luxurious, safe, secure, convenient, and enjoyable. Great place to livesubmitted by Jennifer R. - Sep 01, 2013 |Recommended: YesIt's great. Great location. Nice leasing office and excellent maintenance. Apartment size, styling and location hard to beat in Alexandriasubmitted by Jonathan F. - Aug 31, 2013 |Recommended: YesIn many ways it's like living in a hotel. The coffee in the lobby seemed gimmicky at first but really comes in handy when you're in a hurry. Both the day and night concierges are great taking packages, handling any requests we have, and giving our dog treats every evening (our dog loves this place!). The finishes (ss appliances, granite, separate shower + soaker tub) and the size of the apartment simply just do not exist anywhere else in Alexandria (we looked EVERYWHERE). We finally live somewhere we actually like living in, and not just something we have to put up with.